Undisputed grande dame of the pole vault the Russian beauty Yelena Isinbayeva is red hot favourite to retain her Olympic title at Beijing but her long term career goal is to claim an unprecedented 36 world records. She is European, world and Olympic champion and looks set to dominate the discipline until London 2012 and beyond. Isinbayeva frequently betters her own record but rarely raises the bar more than just one centimetre at a time thereby claiming substantial prize money. Despite the self evident financial gain her stated aim is also to overcome the 35 world records set in pole vault by another Russian, the great Sergei Bubka. To that end she has enlisted the help of Bubka's former coach Vitali Petrov, who guided her over the 'mythical 5m mark' at London's Crystal Palace in July 2005, a landmark leap that leaves other women in the sport trailing in her wake. In August 2005 she claimed her first world championships gold with ease, setting yet another record, and yes you guessed it, of 5.01m. At the Europeans in 2006 after claiming the gold, she had the bar raised 20cm for her next effort, 5.02m and though she failed at all three attempts it showed the level of her utter supremacy. Ahead of the 2007 world championships at Osaka she declared herself unbeatable, a claim born out as she cruised to a second world title with just three jumps and a gold medal for 4.80m. She then raised the bar to 5.02m and after failing to clear it suggested her rivals should push her harder. She then added her third straight world indoor crown at Valencia in March 2008 with a jump of 4.75m on her first attempt to defeat American Jennifer Stuczynski who needed a second attempt at the same height. She only came to the discipline at the age of 14 having dreamed of becoming an Olympic gymnast but not quite making the grade. But early promise with the pole saw her clear 4m at the world juniors of 1998 and there was no turning back, claiming the junior world crown in 2000 before moving up to senior competition. Her arrival on the main stage marked the start of a golden age of the blossoming sport with Feofanova and 2000 Olympic champion Stacey Dragila slugging it out for supremacy. In 2002 she won a merciless struggle with Feofanova before losing out and settling for silver in the final of the 2003 European championships to Germany's Yvonne Buschbaum in Munich. But six weeks ahead of the 2003 world championships in Paris she established a new world record of 4.82m, therefore making her favourite for the world gold, but could only manage third behind winner Feofanova and Germany's Annika Becker. In February 2007, she took her tally of world records to 20 by improving the indoor mark to 4.93m in Donetsk and then going two centimetres higher one year later at exactly the same meeting. 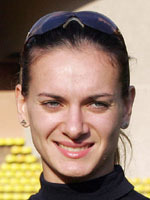 Isinbayeva beat her world record in Rome on the 11th of July 2008 reaching 5.03m. She is unbeaten at major competitions since 2004 and overwhelming favourite to jump higher than the rest in Beijing where she will also target the unprecedented height of 5.04m.